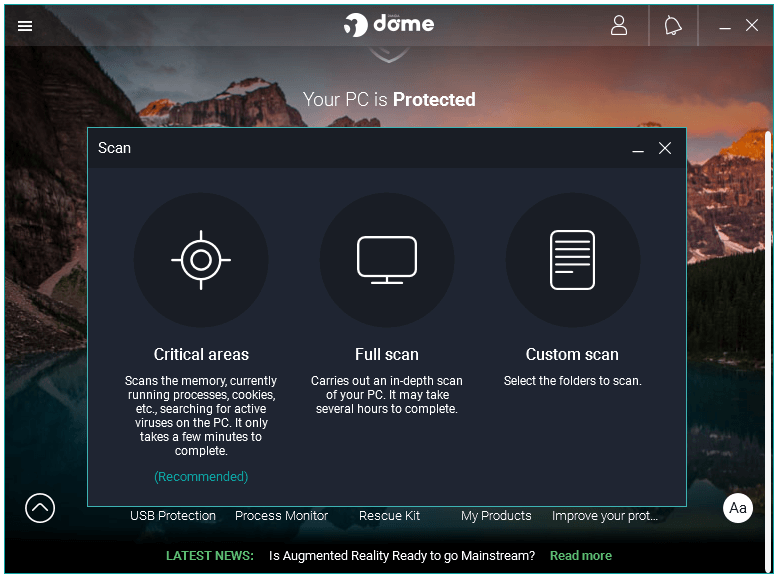 Home » PC » Antivirus & Security » Panda Dome Free Antivirus 2019 Review – Feature-Rich Lightweight Protection for Windows 10. 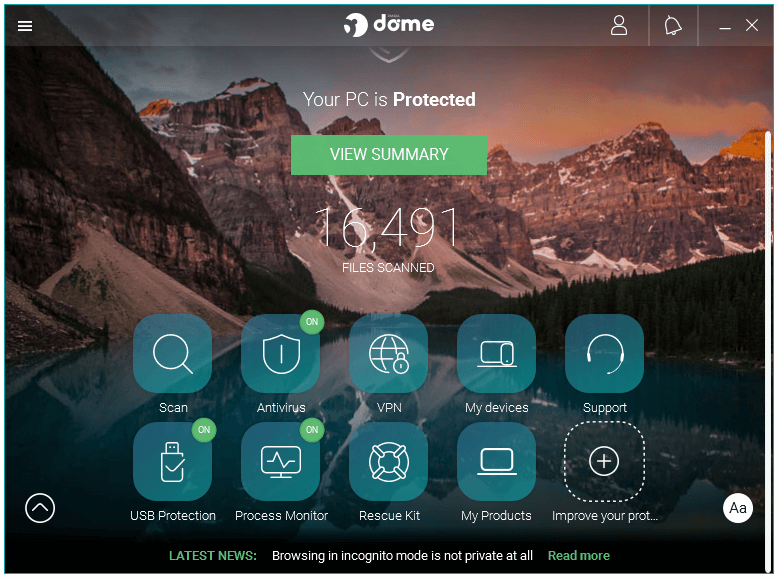 Best Free Antivirus Products for Windows PC in 2019 – Panda Dome. 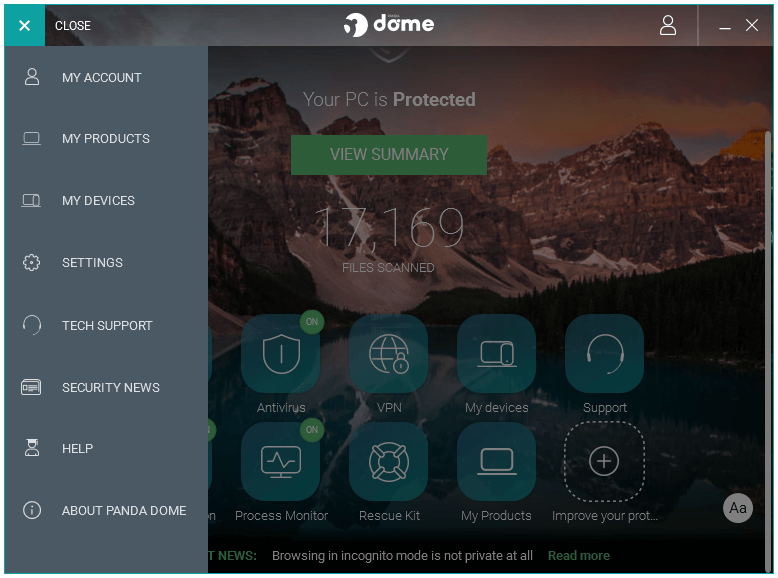 Today’s Panda Dome has its roots in a product called Cloud Antivirus, which was first released by Panda Security way back in 2009. Panda was the first free cloud-based Antivirus for Windows. The unique selling point of that product was the Cloud scanning and analysis feature that took the heavy stuff to the security software provider’s infrastructure, and made the product super light on the User’s system. In 2014, Panda relaunched Cloud Antivirus as Panda Free Antivirus with improved offline protection. 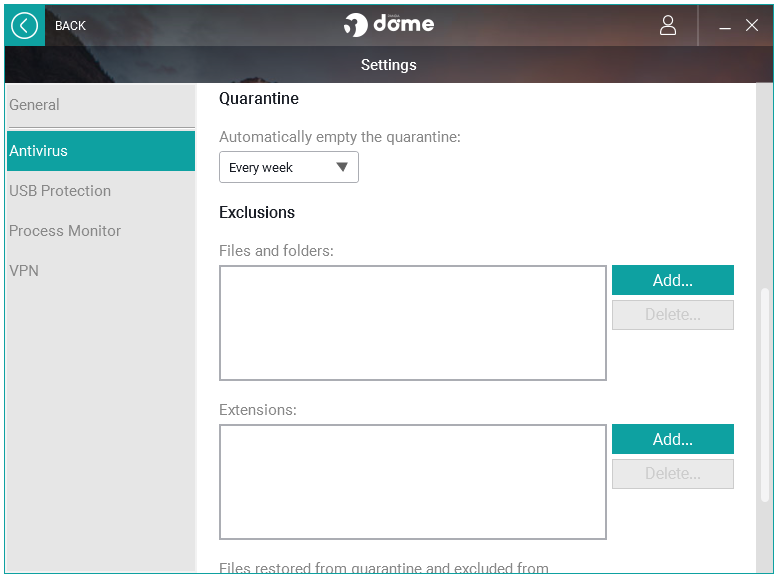 Security features such as the Behavioural Blocker, Heuristic Analysis, Process Monitor, and USB Vaccination combined with the Offline Malware Cache provide a strong protection against all kinds of malware while remaining light on the system at the same time. Virus Bulletin did not test Panda in their most recent test. AV-TEST did not test Panda in their most recent test. Panda is a winner of the AV-Comparatives Advanced award. The Home view lists all of them in the form of a dock. Here’s a list of icons that you get in Panda Dome. Clicking on the Scan icon presents you with the three types of scans supported by Panda Dome. 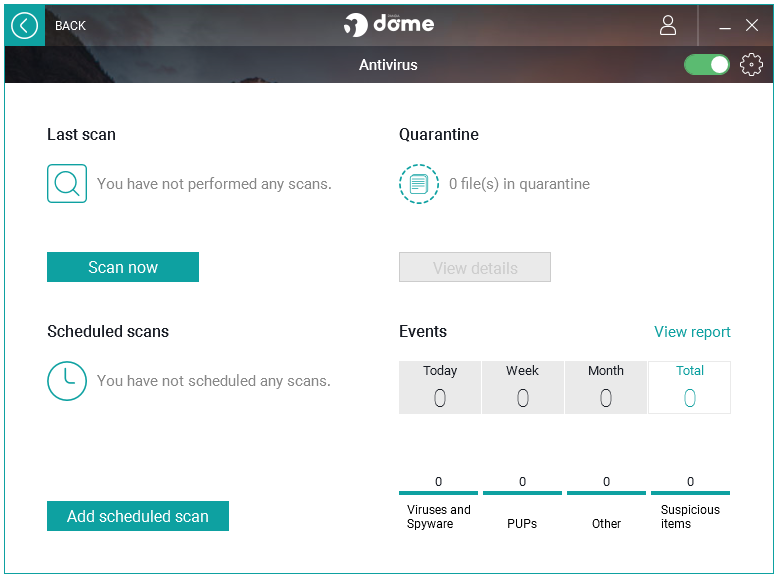 The Antivirus icon takes you to the dedicated Antivirus component window that displays the activities related to the Antivirus. Here, you can see details for items such as Last scan, Scheduled scans, Quarantine, and Events. The USB Protection icon opens the USB device related security settings provided by Panda. 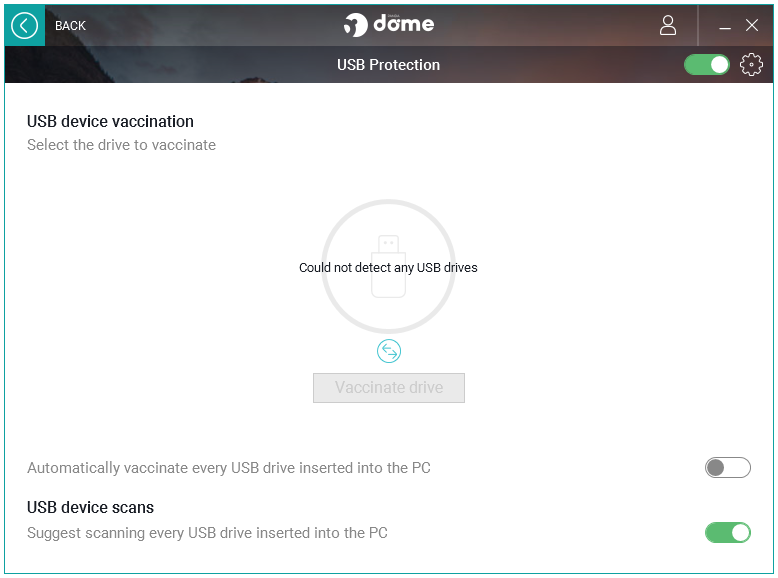 In the USB Protection window, you can configure the USB device vaccination and scans settings. 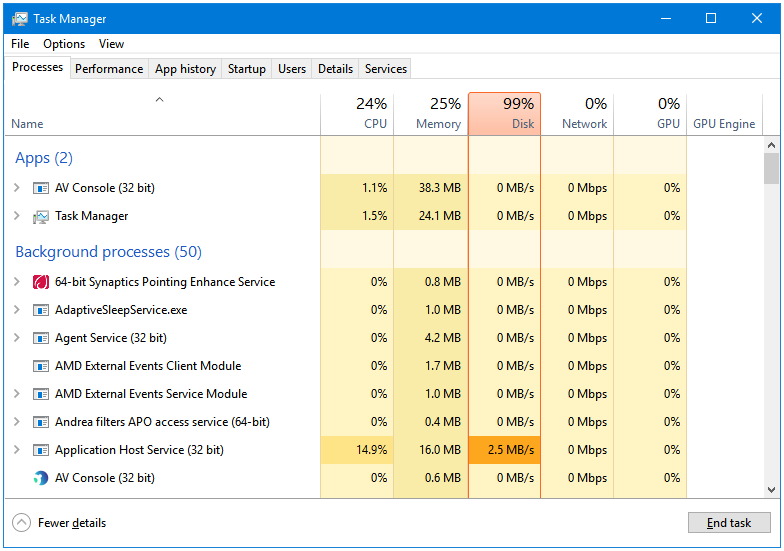 Process Monitor is Panda’s own security-focused task manager/process manager; it displays all of the processes running on the system currently. As you can see, the processes are categorized into four groups. 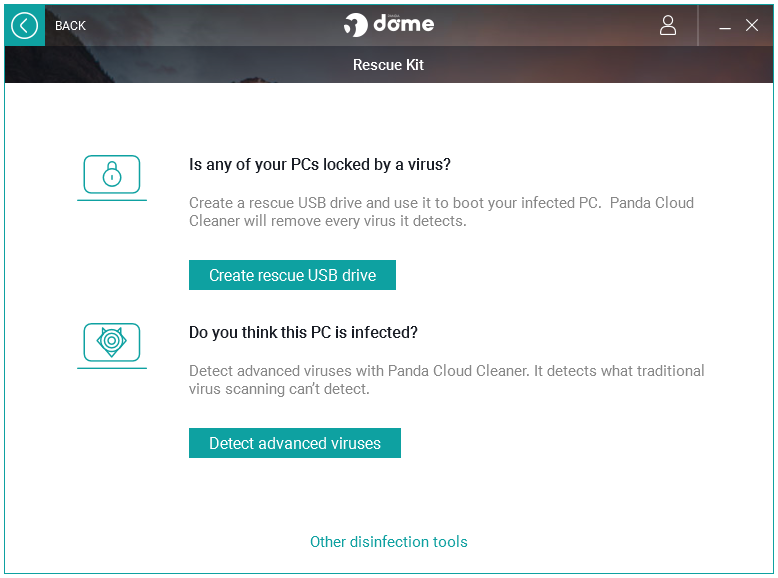 The Rescue Kit feature lets you create the bootable Panda Cloud Cleaner Antivirus Rescue Disk for Windows, which you can use to boot your computer from in case of a malware attack. Use it to and scan and remove malware that hide themselves from antivirus products during normal booting of Windows. 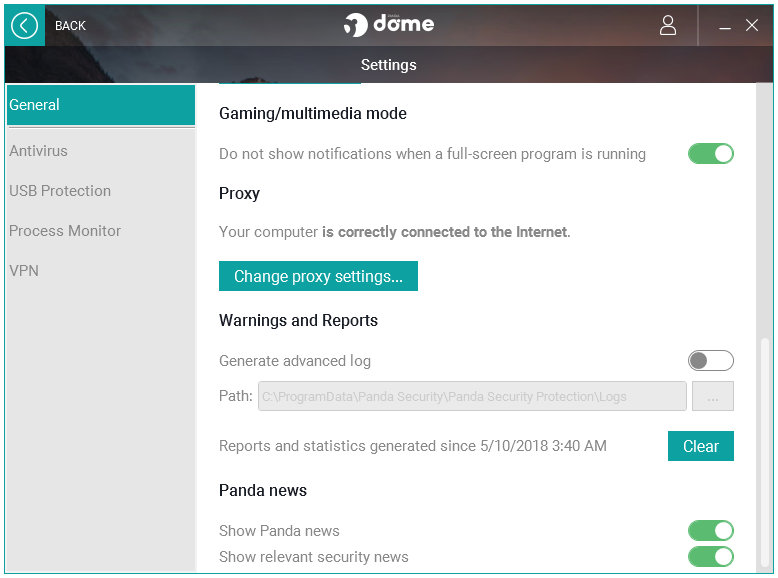 Click on the Settings option in the menu bar to open Panda Dome settings. The settings are categorized and divided into five side tabs. The General tab displays general settings of the program. Here’s a look at the settings available under this window. Account – User account details. Language – Change the language of the program. Customization – Change the background image of the program. Console login password – Setup a password to use the Panda console. Automatic updates – Check for the latest updates. Gaming/multimedia mode – Enabling this option disables the notifications and popups to give a non-interruptive experience. Proxy – Configure the proxy settings. Warnings and Reports – Stores the antivirus logs. Panda news – Something that you should disable as soon as you install the program. The Antivirus tab lets you adjust the settings of the most important component of this program, the Antivirus itself. It lists all of the antivirus related features and settings. The settings are categorized into the following four sections. The USB Protection tab includes the settings related to USB drive scans. 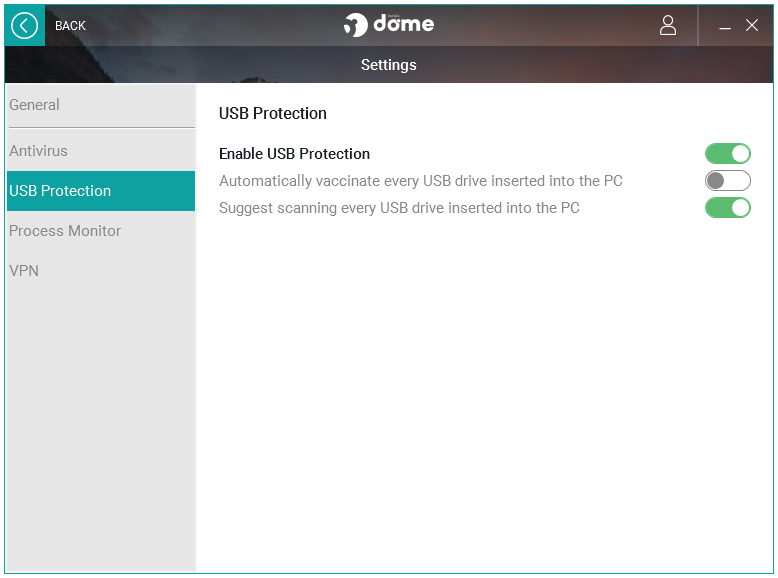 You can configure it to scan or notify you whenever a USB drive is inserted into the USB ports. You can configure Panda to automatically scan every USB drive inserted into the computer. You can also set it to automatically vaccinate these USB drives. 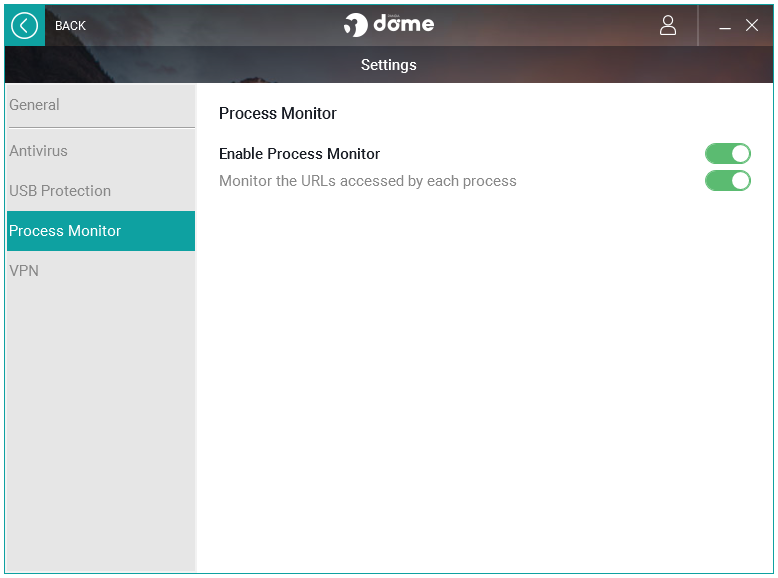 The Process Monitor tab includes the settings related to the Process Monitor component of Panda Dome. 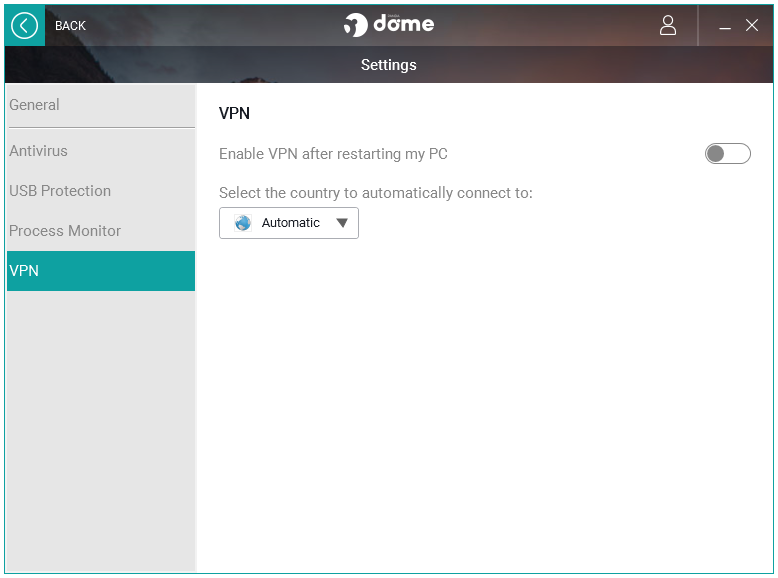 The VPN tab opens the settings related to the VPN feature included in Panda Dome. The VPN service is powered by Hotspot Shield. Only 150MB of data is available in the free version. Hard Disk Used: The installer is around 60 MB in size. 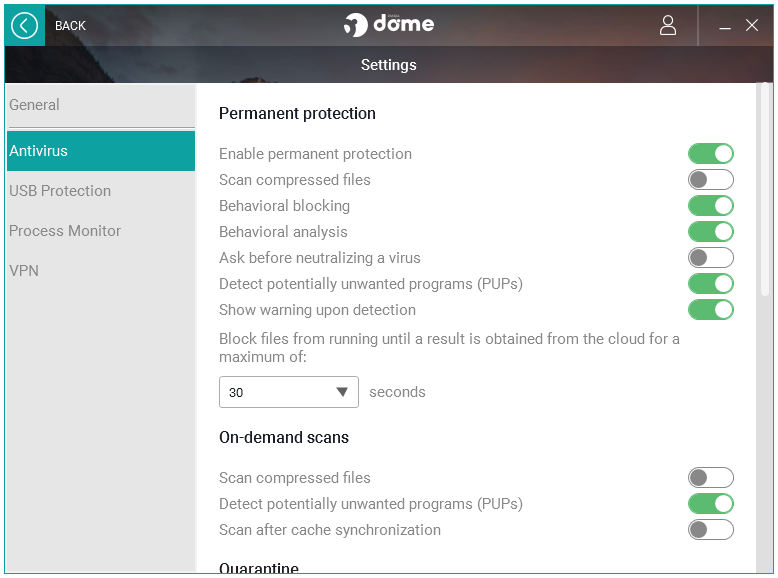 After installation and an update, the Panda Dome Free Antivirus uses around 250 MB of the disk space. CPU and RAM Usage When Idle: Panda Dome uses only about 15 MB of your RAM when it is idle. The CPU usage is stable at 0%. 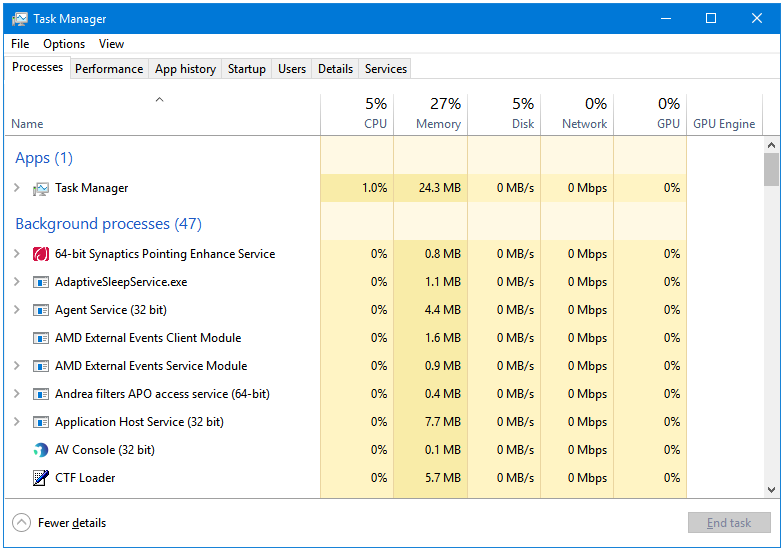 CPU and RAM Usage When Scanning: Panda Dome is light even when it is scanning your system, it uses only about 60 MB of RAM when it is performing a full system scan. 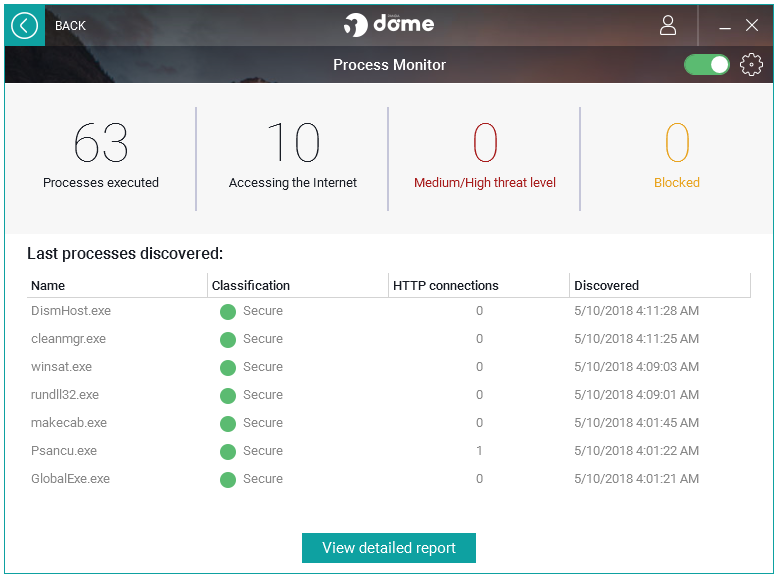 During Scanning, the CPU usage of Panda Dome fluctuates between 5 to 20%, and is stable at around 15%. Everything opens in the same window. Easily go back to the Home view by clicking the Back button at located at the top-left corner of the window. There is a text Toggle button at the bottom-right of the Panda home screen that enables or disables the text titles for the dock icons. A neat little design element. Panda has another nice and very visible customization setting called Change the application background. It lets the user change the background image of the program. Panda gives its users 8 images to select from. You can find this setting under the Customization section inside the General tab in Panda Settings window. Click on the Change button next to the Change the application background setting to open the Application background change window. 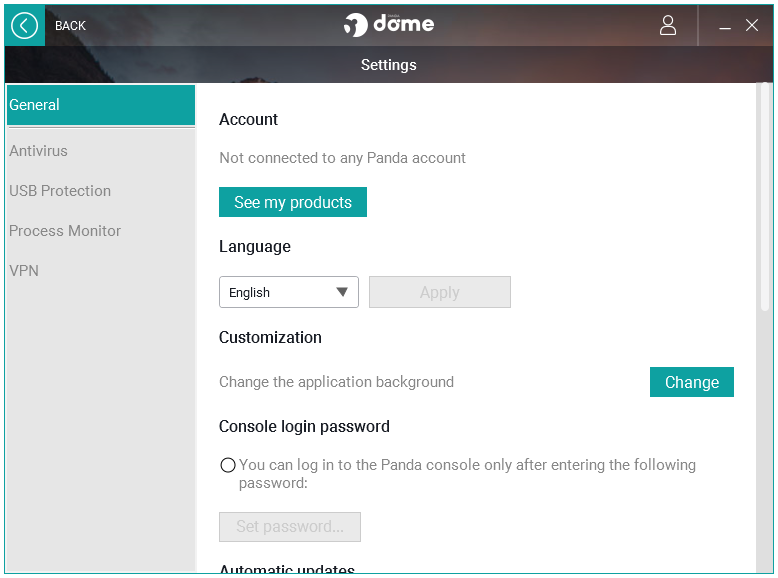 By default, the Change automatically checkbox is ticked, which means that the background image on Panda Dome is changing automatically. 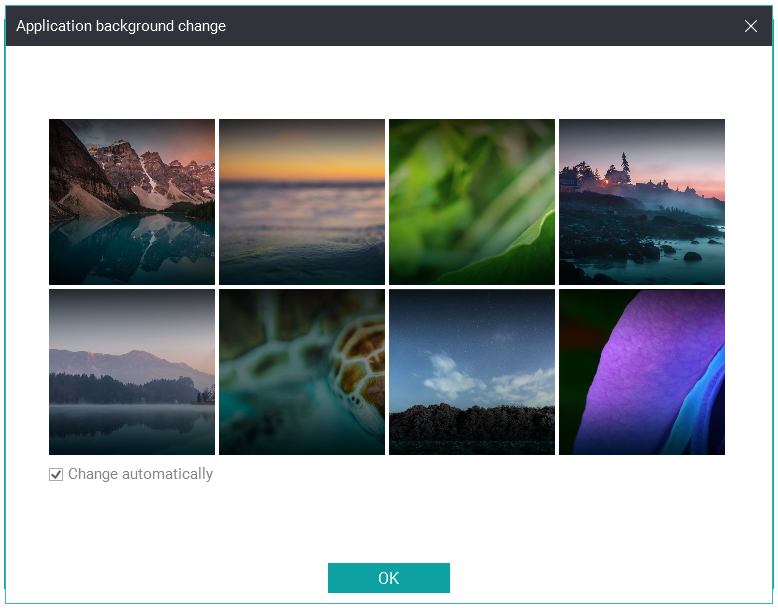 However, if you are not a fan of this slideshow feature or just want to use one image at a time as the background image then all you have to do is click on the image that you want to use, it will automatically clear the checkbox, and then Click on the OK button apply the changes. I would have preferred some solid, gradient, or textured background options as well along with the wallpaper images provided with Panda Dome. Panda downloads and installs the Panda Safe Web program even if you don’t agree to it. 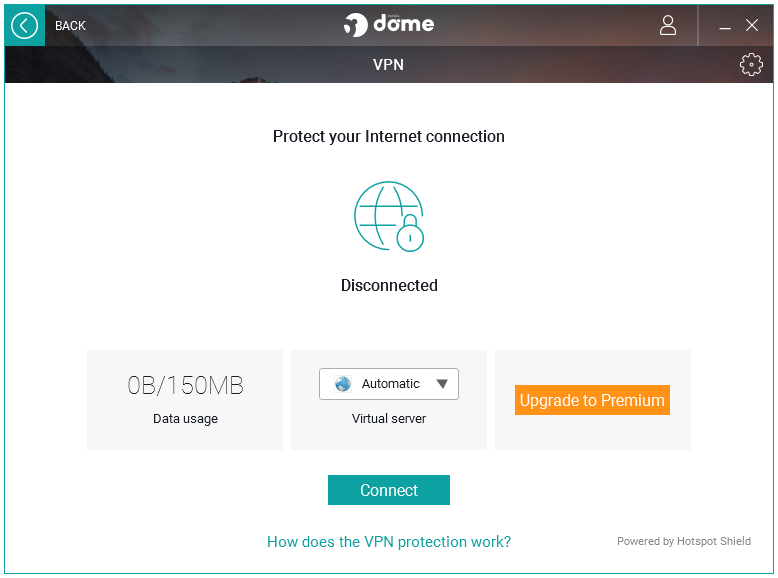 After uninstallation of Panda Dome, it leaves behind the Panda Safe Web program. Panda tries to set the Panda Safe Web, which is powered by Yahoo, as the default search provider. Panda tries to set Panda Safe Web as the default home page of web browsers. At the bottom, there is a Latest News bar that displays the security-related news. It can be easily disabled by going inside the General Settings. Panda displays news about their products and services in the form of popups at the bottom-right corner of your computer. This, too, can be disabled from the General Settings window. 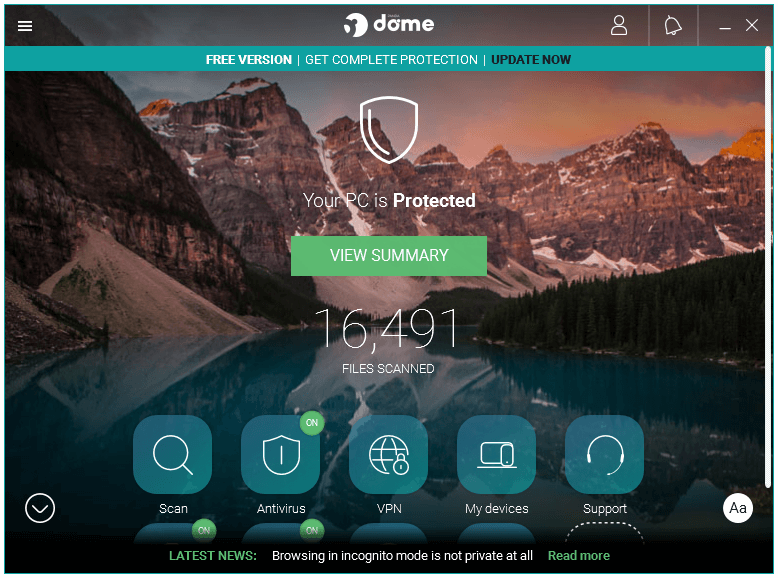 There is a bar at the top of the home screen that continuously reminds you that you are using the Free Version, and that you should get the Complete Protection.